You will be completing a variety of small drawing tasks within this unit. Below are posted the drawing tasks that you will be completing in order - you will find extra copies of the rubric and any images provided in handout form. Use the smooth shading techniques (using different pencils and gradually layering) to make each object within the image look three-dimensional. Pay attention to the location of your chosen light source. Recreate the values of the image using either hatching OR cross-hatching (your choice). Select 1 image from the options provided (see the files attached below). Paste this image into your sketchbook - measure and draw a 1 inch grid on top of this image; this will result in 9 boxes in total. Redraw a grid on the empty side of your page, but double the dimensions to a 6 x 6" box with a 2 inch grid dividing the space. This enlarged grid is where you will re-draw the image you have chosen, erase your grid lines, then shade your image using a variety of pencils trying to accurately re-create the values and textures of the original image. In class, you will draw from live models using both the gesture and contour drawing techniques practiced in class. You will complete several drawings over the course of one class period. Your best gesture and your best contour drawing will be selected and each will be marked out of 5. If you are not present during this drawing assessment, a previous practice example may be used or you may wish to submit additional life drawing that you have completed at home (please discuss with your instructor). Explanations of these two types of drawing can be found in your course book under "Studio Concepts: Drawing." In class, you will draw from a still life arrangement. You will only be required to draw 3 objects and the surfaces that they are sitting on. You are being marked on correct placement and proportions of the objects therefore use sighting to judge relative size while drawing. Values may be added in order to finish your drawing. You have 75 minutes to complete this drawing. NOTE: If you have missed this activity in class, it is recommended that you create your own still life at home to draw from and allow yourself no more than an hour and a half to complete the drawing. Review the ways of illustrating Space (i.e. depth) in your Elements of Design notes. In particular you are going to create a drawing that has a foreground, middle ground, and background taken from three different source images (select the best ones from those collected for class). In addition, you will reinforce the sense of depth by shading OR colouring your image appropriately to reflect a sense of depth shown through atmospheric perspective. You will create three empty boxes in your sketchbook, each measuring either 6 x 6 " or 10 x 10 cm. Within each box you will create a design illustrating each of the types of Balance: Symmetrical, Asymmetrical and Radial. Your design will be created through the use of shape, you may wish to trace objects or measure to achieve consistent sizing. The finished designs should be coloured and demonstrate a colour scheme that we have discussed in class (e.g. monochromatic, complimentary, analogous). Review your Principles of Design notes to assist you with this. Our final drawing task will be a portrait drawing that you can complete in your sketchbook or on a small poster sized paper. Choose one of your black & white photos to re-create as a pencil drawing. You will draw if using the grid method and shade using a variety of pencils. 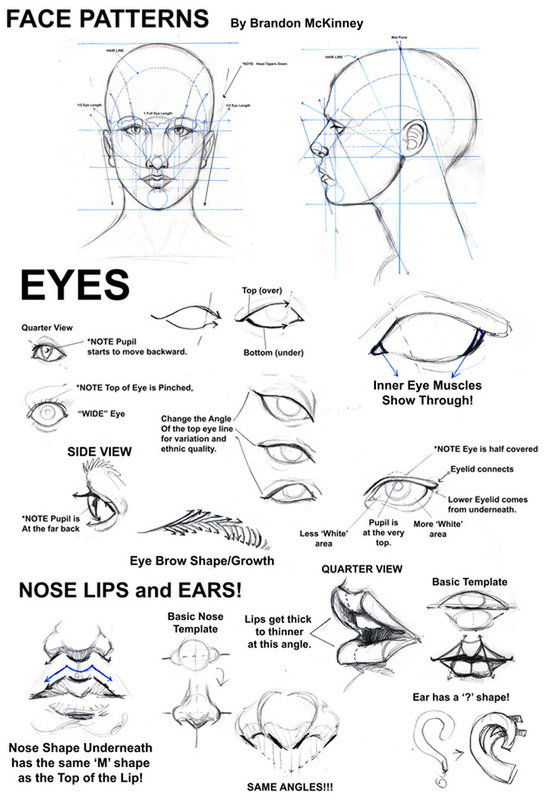 To properly prepare for this drawing, it is helpful to know some basic proportions related to the human face. 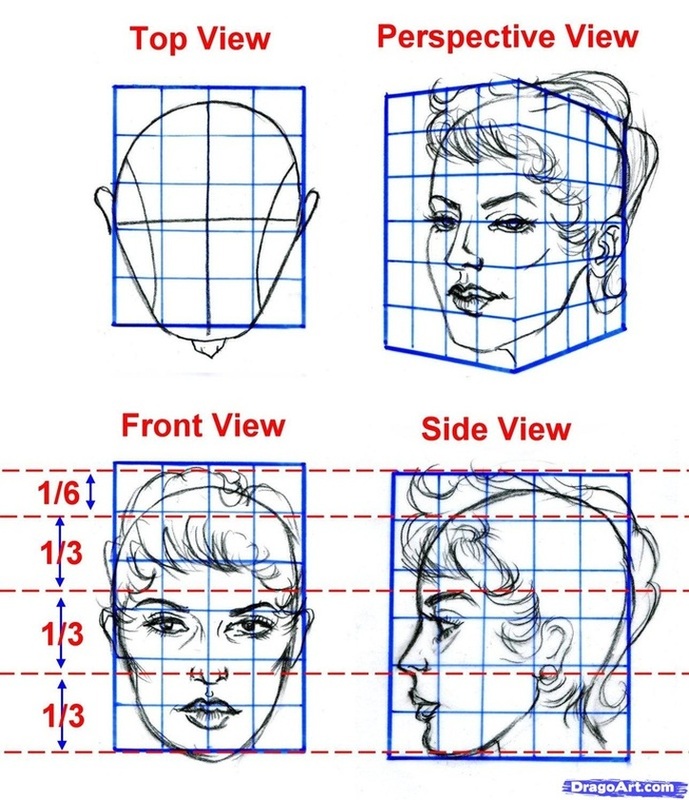 Take a look at some of these diagrams and the following link to improve your drawing accuracy.